It’s 8 o’clock on a Monday Morning, and Patricia and I have decided to kick start our week with a banging breakfast at one of London’s Iconic venues: Sketch. It is rather unusual for us to wake up this early (we are Spanish, after all) but business calls and we like to confuse people, so why not breaking the routine and go for a fantastic banquet? Sketch has always been one of my favorite spots in Central London. Tucked away off crazy Regent Street, this gems is to me where fashion meets art and meets food. And here I’ll tell you why. For starters, the decor is super. It’s like you are visiting an art-gallery inside of several restaurants, bars and a hip egg-shaped toilets. Sketch consists of the Lecture Room & Library, the Gallery, the Glade, the Parlour, and the East Bar. Personally, I find it very difficult to choose a favorite room. Each one of them has a very different style and that style makes it shine on its own. I love the pink life at The Gallery and the fresh cones with tea are a killer, but then again the Glade and its whimsical yet dark forest style and food are also damn good. 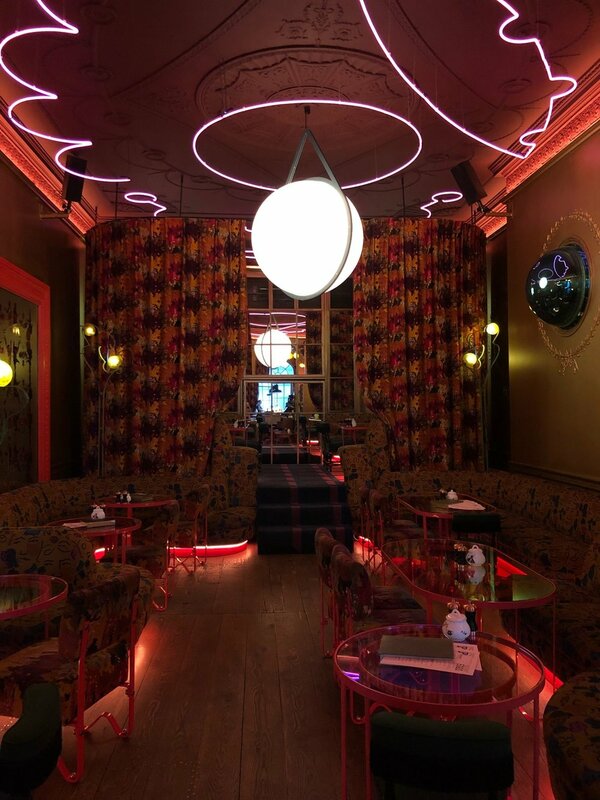 The East Bar is more intimate and dark, probably great for a date and the parlour works fabulously if you want to catch up with friends while offloading yourself from shopping. Each single detail at each one of the rooms has been thought after, from the waiter outfits down to the cutlery. Now the food. The food is another level. At the Lecture Room you can enjoy a Michelin-rated menu (still yet to try) whereas at the Parlour you can enjoy a casual breakfast and all-day menu. The Gallery and the Glade offer high-tea and lunch, respectively. For the occasion, we dine at The parlour. Tea, coffees and juice were running through the table as we frantically discussed our weekend and the wide selection of eggs (hello tempura scotch egg, I’m looking at you) certainly made our day. Not to mention the pancakes, YUM. We’ve also had the chance to go for tea at The Gallery (read our review here) and we could not recommend it enought. It will leave you wanting to come back for more tea and scones, the latter are fresh and to die for. Finally, the toilets. It’s funny to think that somebody would go to a restaurant just to check out the toilets. But believe it or not, this is what happens. And understandably so. I’ve never encountered such thing, and you should see it with your own eyes. Unisex egg-shaped toilets (with a forest soundtrack whilst you go do your thing, in case you need help), with fish-eye mirrors and bonker lighting. It’s like I’m in Alice in Wonderland all over again. How wonderful.